Spending time in nature gives most of us a feeling of peace and wholeness with the earth as well as a mood boost, but those feel-good emotions are usually not enough for scientists who are forever interested in quantifying things. A new study published in the Proceedings of the National Academy of Sciences does just that: it measured the working memories and attention span of 2,623 children in Barcelona at intervals throughout a year after surveying the amount of vegetation around the children’s homes, along their commutes to school, and around their schools. 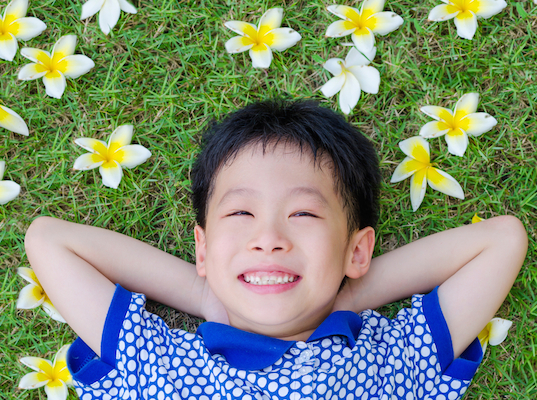 Using a series of word and number tests, the researchers found that children who had more greenery around their schools improved their working memory and attention span over the course of a year. Green space at home or on the way to school didn’t appear to have the same benefits. The reasons for the plant-based boost could be numerous: green spaces reduce external noises (particularly pesky city noises like traffic), are inviting play spaces, promote a connection with the earth, and act as a buffer from air pollutants. Others may be quick to point out that this positive link indicates correlation and not necessarily causation, but the study certainly offers another compelling reason for schools to embrace nature and foster its growth around their grounds. Spending time in nature gives most of us a feeling of peace and wholeness with the earth as well as a mood boost, but those feel-good emotions are usually not enough for scientists who are forever interested in quantifying things. A new study published in the Proceedings of the National Academy of Sciences�does just that: it measured the working memories and attention span of 2,623 children in Barcelona at intervals throughout a year after surveying the amount of vegetation around the children's homes, along their commutes to school, and around their schools.�Using a series of word and number tests, the researchers found that children who had more greenery around their schools improved their working memory and attention span over the course of a year.